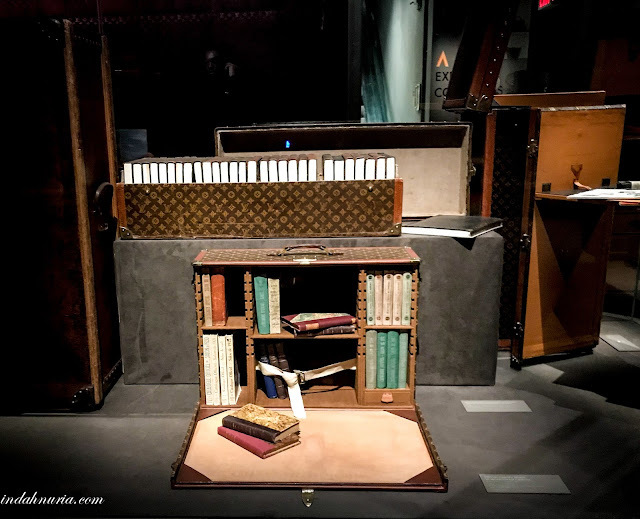 "Welcome to Louis Vuitton New York Volez, Voguez, Voyagez Exhibition"
The lady with auburn hair sweetly smiled to me while handing the booklet of the exhibition to me and my mom. Using my lunch break, I sneaked out to downtown Manhattan to see the exhibition I have been waiting for together with my mom, while she's still in NYC. 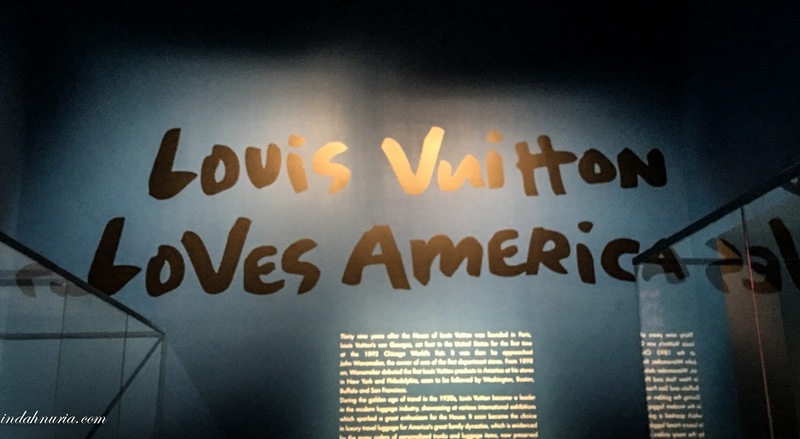 On the wall, a huge screen (or probably screens) showed a non-stop NYC subway adorned with Louis Vuitton stickers and the sign where the exhibition begins. "This is going to be great!" I told my mom as we stepped into the room and enjoyed the first look of the famous Luis Vuitton. 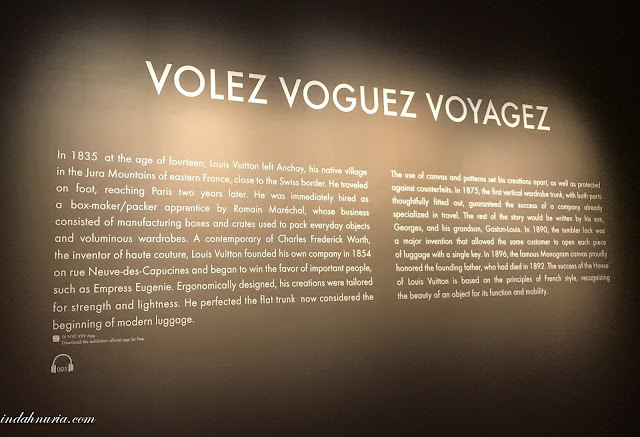 It might be a bit too late as the event has already concluded, but Louis Vuitton New York Volez, Voguez, Voyagez Exhibition is indeed one of the most amazing exhibitions I have ever attended to. Well, I am not exaggerating. 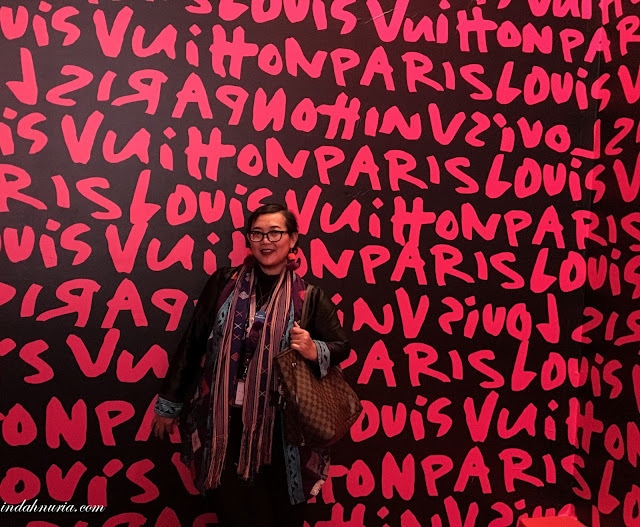 I have been enjoying Louis Vuitton's wonderful art works and creativity since I was assigned in Geneva. 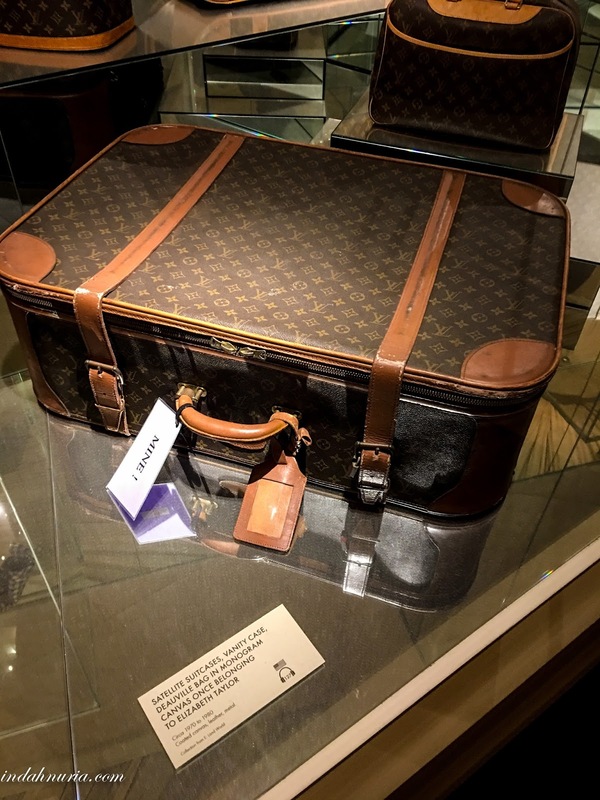 Well, obviously, Louis Vuitton products are not cheap at all for its exquisite designs, high quality leather, and durability. 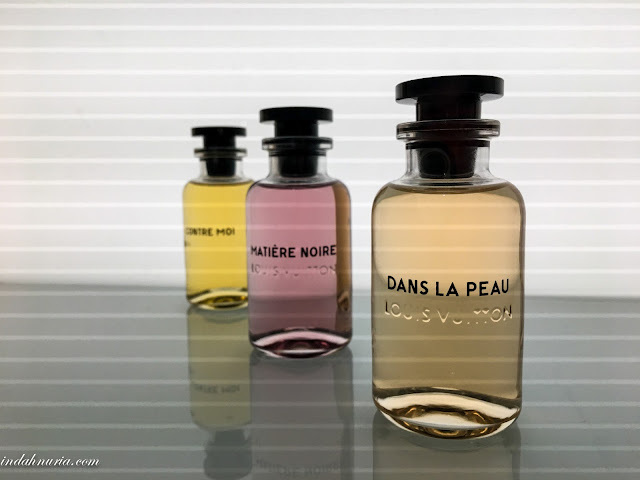 It's famous for its exclusive collections and I am more than eager to get them. So I can only acquire them after I have saved enough money. I remember vividly my first LV bag, Montorguell, that I bought in August 2008, for my 31st birthday! I still have it with me and it's one of my favorites, although I then have acquired more bags and wallets after I fell in love with its classic designs. So, back to the Exhibition. Volez Voguez Voyagez, - or literally means Fly, Sail, and Travel - Louis Vuitton NYC exhibition was held in American Stock Exchange Building, from October 27, 2017, to December 7th, 2018. 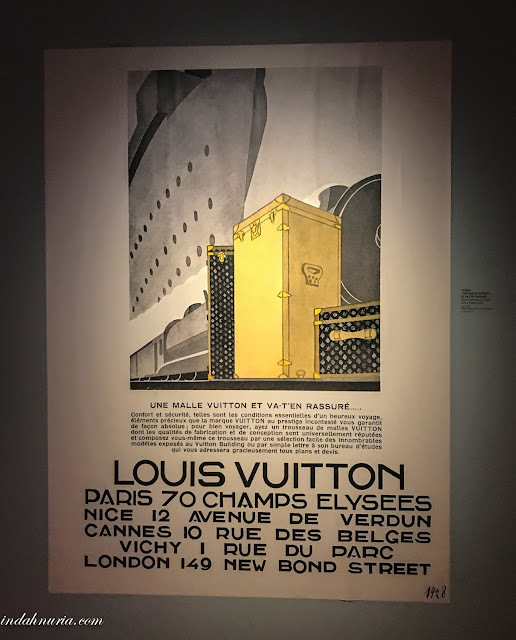 The exhibition is free of charge but you have to register for the ticket at LV's website. You could definitely walk in directly to the venue but pre-registration is highly recommended in order to ensure you get the ticket. The show was professionally managed so they made sure that not too many people were flocking at the same time. As we stepped into the alley, we saw the non-stop animation movie on a huge screen showing the specially adorned with LV stickers and ornaments subway symbolically taking you to this place. 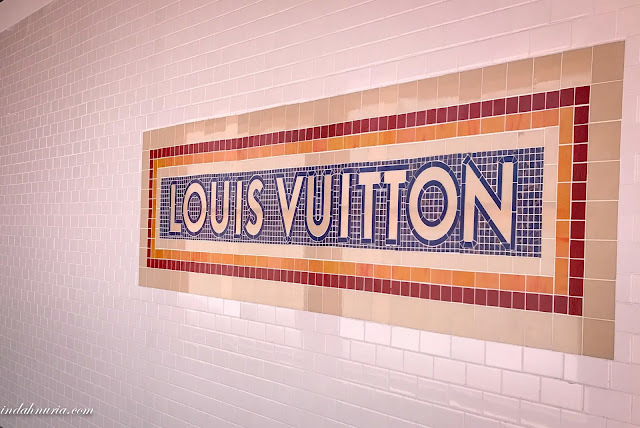 On the opposite wall, a familiar ceramic mosaics, which we see in almost every subway station in this city, bore the famous name. 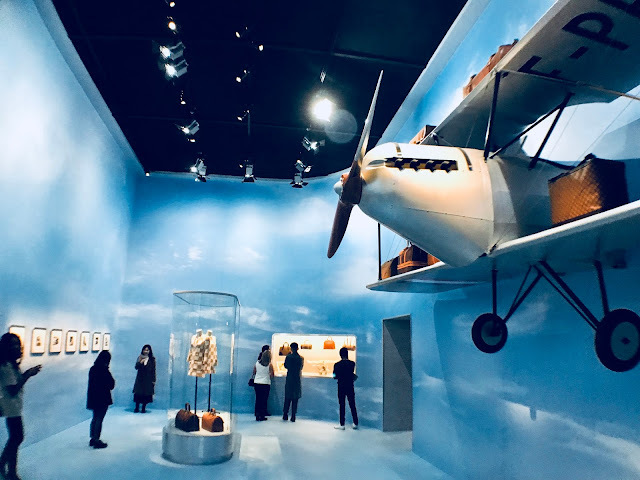 The exhibition was curated by Olivier Saillard, with Gaël Mamine as the Associate Curator and Robert Carsen as the Artistic Director and Set Designer as well as Alexis Coussement as the Lighting Designer. 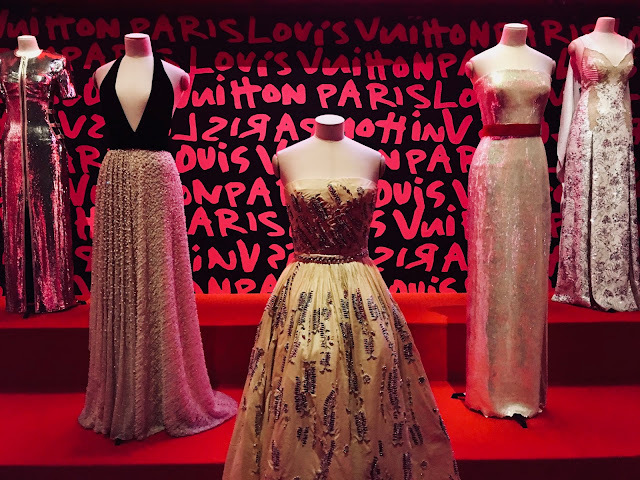 The Exhibition is also supported by so many top-notch museums, individuals and institutions, including Musée de la Mode de la Ville de Paris, Chattering Deneuve, Christian Dior Couture, and Museo Salvatore Ferragamo. They are indeed doing an amazing job! 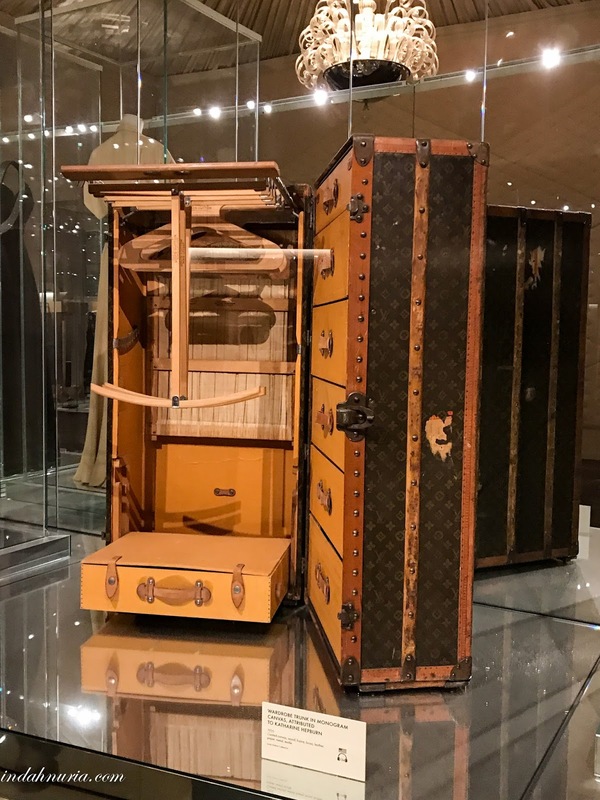 The historical story of the House of Louis Vuitton, started by the late Louis Vuitton in 1854 and successfully continued by Georges, his son, and Gaston-Louis Vuitton, the grandson, is beautifully displayed in a breathtaking, colorful journey. 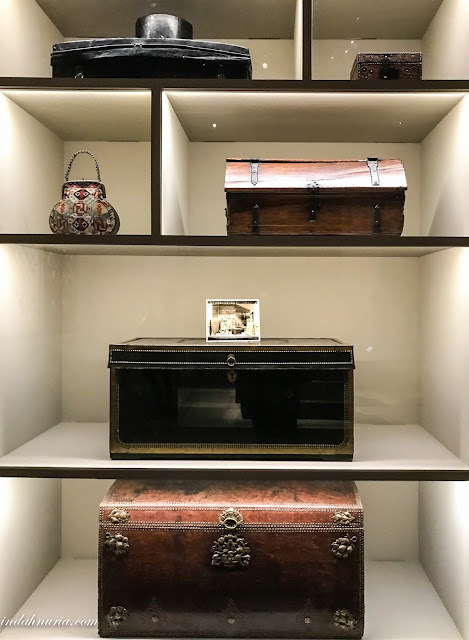 You will be surprised to learn how the House of Louis Vuitton, which is now famous for its exquisite and luxury lines, started by a super talented box-maker/packer. 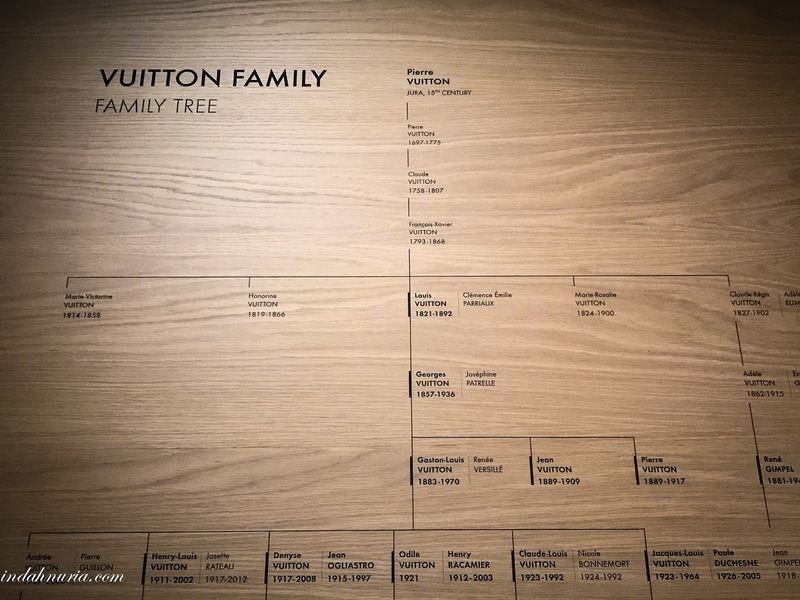 14-year-old Louis Vuitton had to walk (yes, walk) from his hometown near the Swiss Border, at the Jura Mountain (which is close to Meyrin, Geneve, where we used to live back in 2007 - 2011), to Paris. And it took him 2 years to reach Paris. Such a determined young man! The Exhibition itself was divided into 10 different parts, starting from the very beginning of this House business, the great contribution of Louis Vuitton to the global art of traveling, to various creations, collaborations, and Louis Vuitton loves America. It took me and my mom almost 2 hours to finish enjoying all those displays. I took all the photos using my iPhone 7 plus, so excuse me if some of the photos, particularly those taken in low-light rooms, are not that sharp. 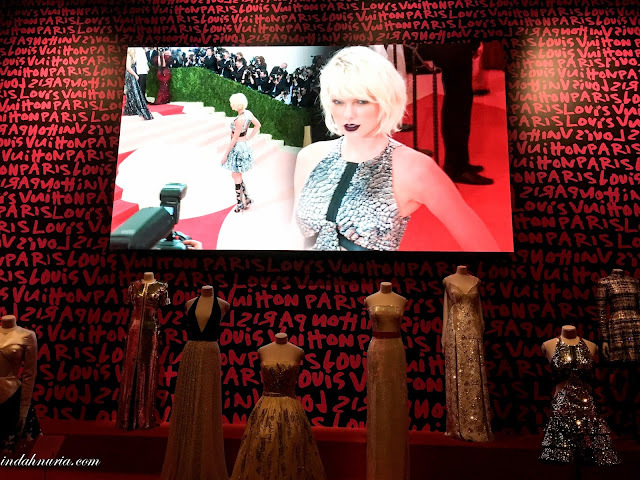 Now, let's take a closer look at the Exhibition, shall we?. Here in this part, we were taken to the very first part of the history of the House of Louis Vuitton, looking at various traveling trunks, - in different model, functions, and colors- which made LV become one of the most wanted trunk-maker at that time. 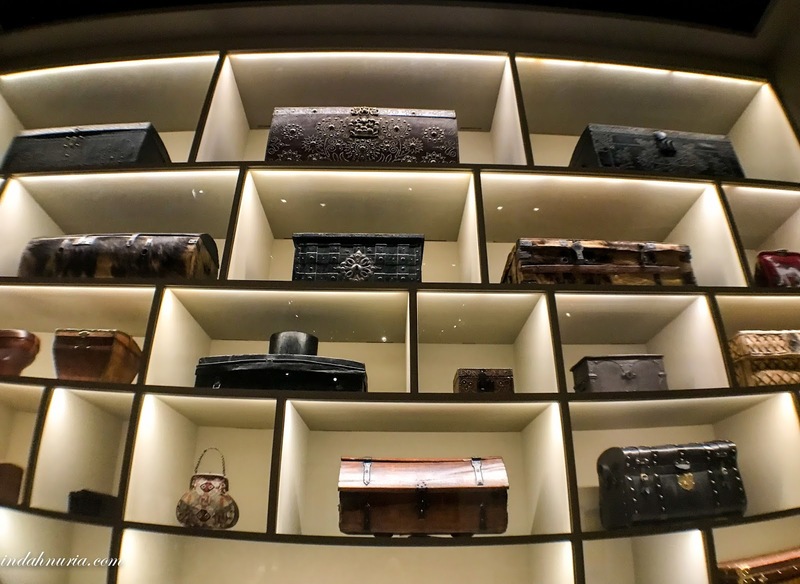 Can you imagine back then when you have to bring trunks wherever you go? I saw some specimens as well when we visited Ellis Island, next to Liberty island, when those coming from outside of NYC were firstly landed. 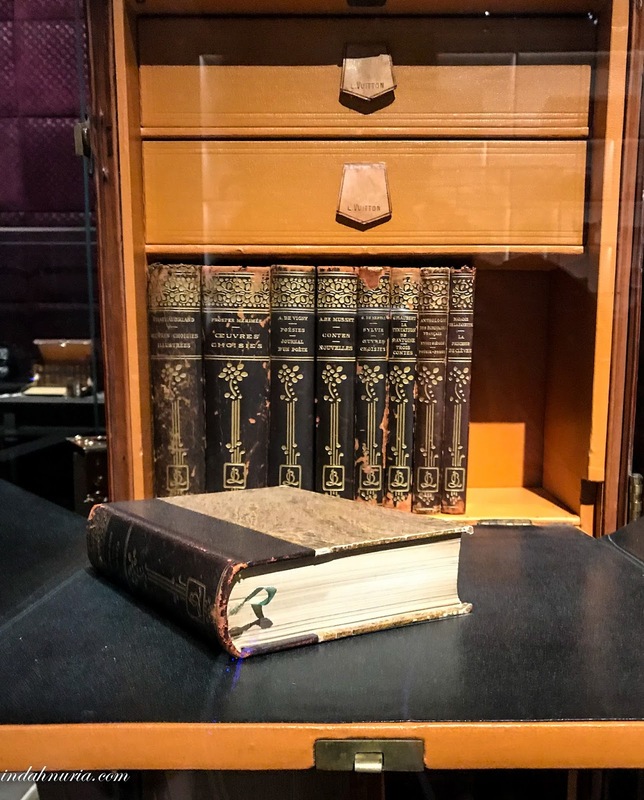 Why the trunk of 1906? 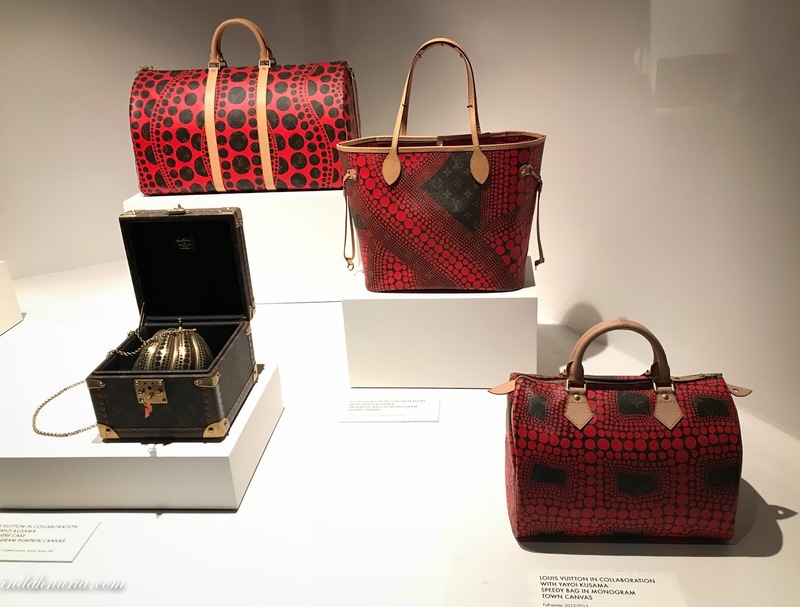 Because it was the year where the works of Louis Vuitton was formally listed in a reference catalogue, complete with its distinct designs and details. What impressed me most is the elegant look of those trunks and their efficient functionalities. From dresses to gloves, to hats and books. All are safely and neatly saved inside those trunks. This is like an extension of the incredible trunks of Louis Vuitton. At that time, woods had been extensively used and transformed into great artworks. 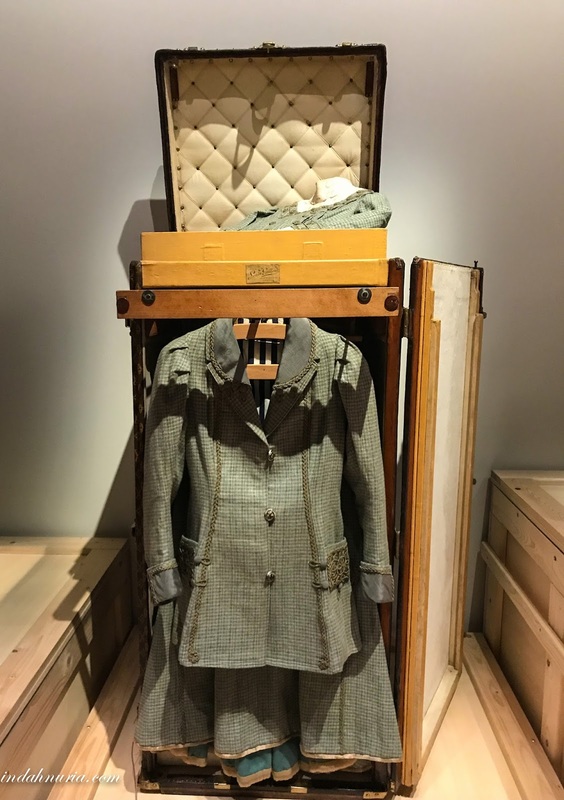 And obviously, woods have a special place in young Louis' heart, as it was considered as the lovely reminder of his forest hometown as well as his initial expertise in box making. 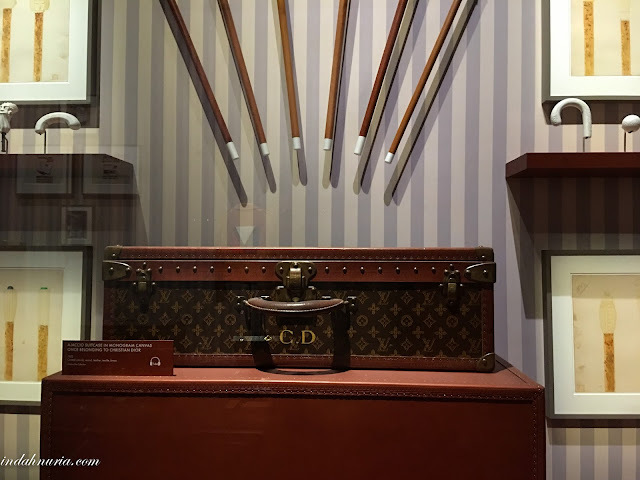 I have to admit young Louis had magically transformed those woods into a special piece of functional and elegant item. You would be traveling across the dessert, sailing high seas, driving along the scenic routes and flying over beautiful lands and islands. And you wanted to do it in style, bringing your favorite dress ! 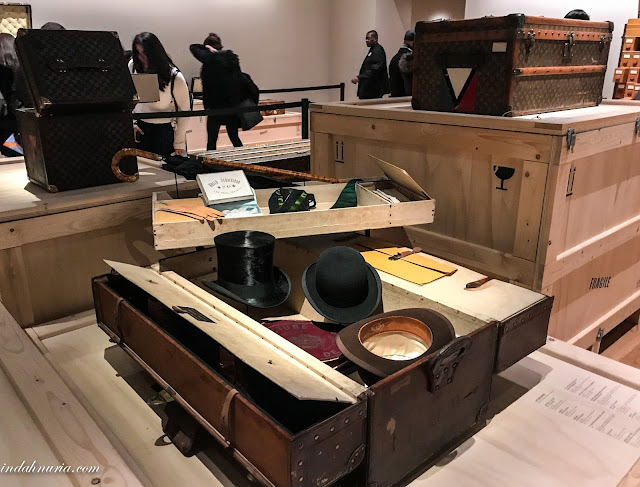 I guess this is where Louis Vuitton's works are stepping into the pictures. We were enjoying another beautiful phase of Vuitton's invention and great contribution in the art of traveling. 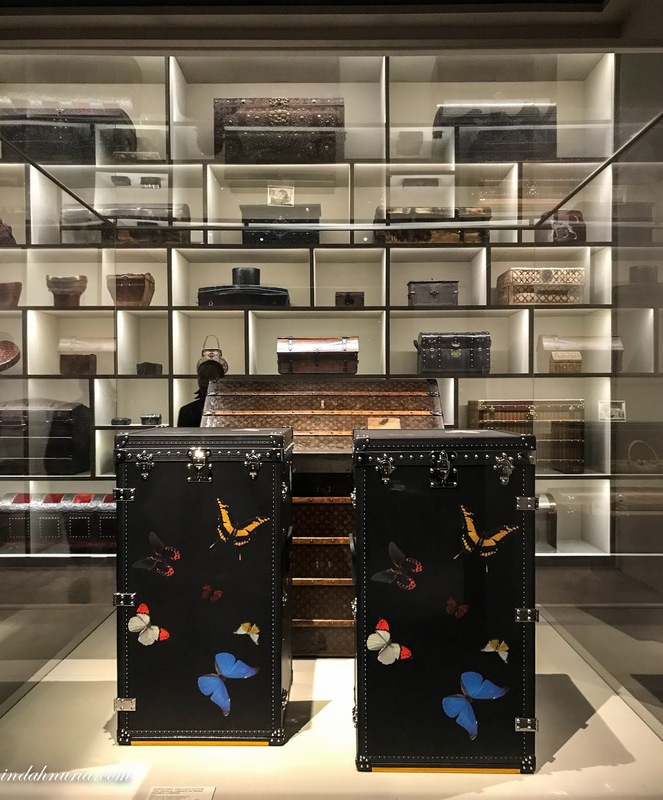 We saw colorful traveling trunks made of different materials and the evolution of steamer bag, which is believed to be the origin of hand luggage. 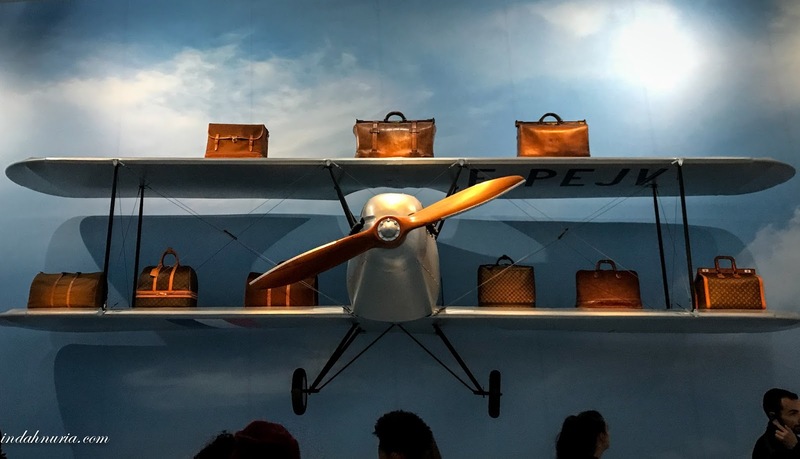 I have to admit that this part is what interest us most, with yachting, aviation, automobile and trains elegantly displayed. The replica of the Orient Express is what I really love! It felt like we were there in one of the cars of the famous Orient Express with all its posh passengers (it was obviously expensive to travel with it, especially as you stopped in those exotic places in Europe!) and their luggages. The loop video showing different sceneries from the passengers seats giving a more real touch to this section. 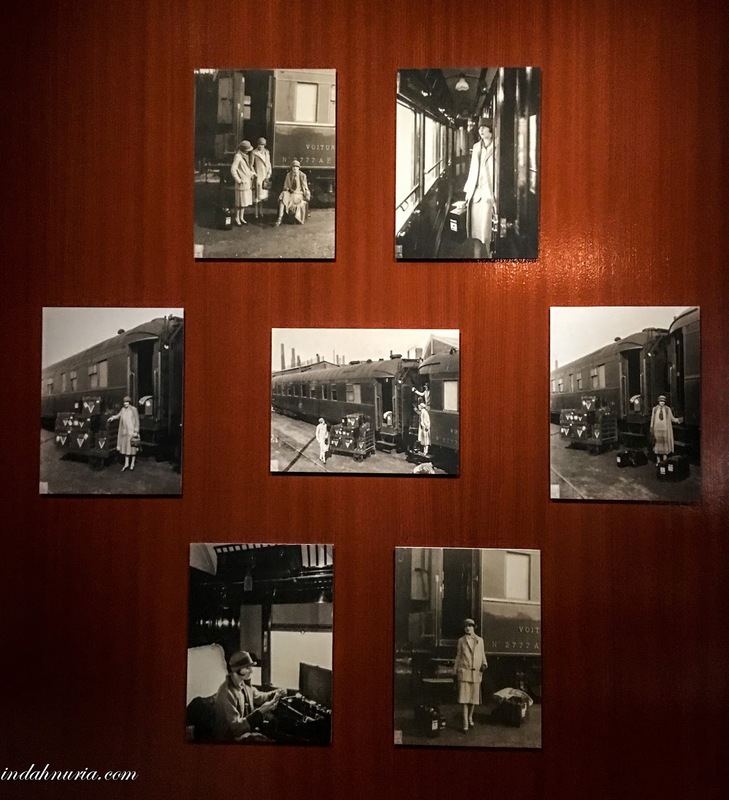 And on the wall, they put so many photos from private collection showing those who were traveling with the Orient Express with their sturdy trunks and trendy fashions! Look at all these gorgeous ladies! Plus some stickers from famous hotels around the world where the train stopped and passengers could stay overnight to explore the cities. 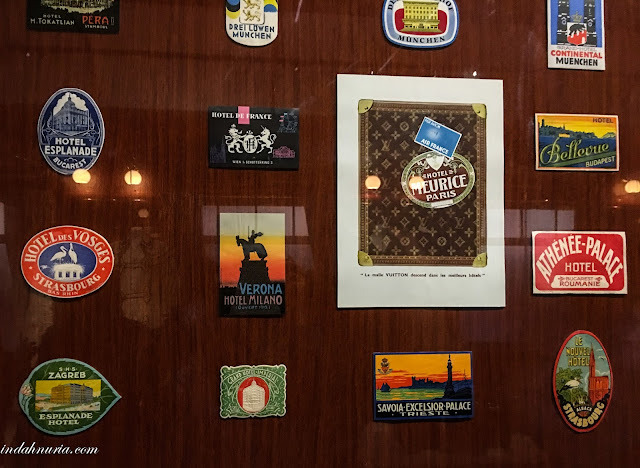 Paris, Bucharest, Milan, Munchen, Strasbourg, Venezia, Zagreb, Vienna, Laussane, are a few examples of those incredible places they visited. I instantly remember Agatha Christie's novel, Murder at the Orient Express. No wonder we had some robberies and even murder during its trip, considering all those valuable items the passengers brought along with them! Now you see why I love this section so much! 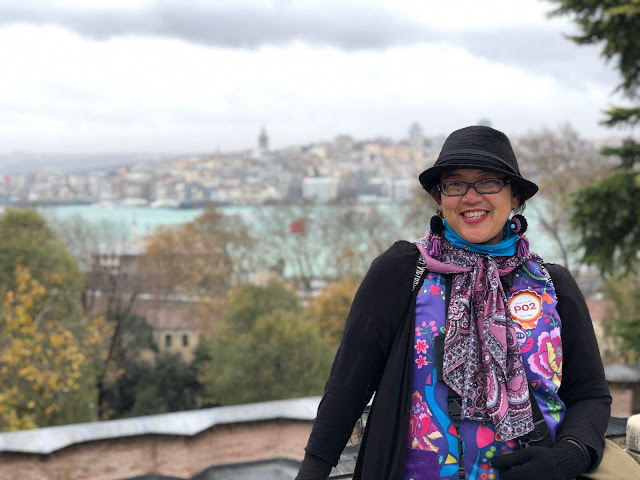 Being a traveler myself, I hope I do have the privilege to travel in style to those gorgeous cities around the world. More customized trunks were displayed here and this time, we have various trunks specially designed for prolific writers and prominent painters. Welcome to one of the finest and the most exquisite collection of trunks and boxes from different parts of the world! I love seeing those wonderful old, antique trunks collected from different parts of the world, courtesy of Gaston-Louis private collection. Some of them have amazing details indeed! Louis Vuitton and fashion are an item indeed. And super stars, actors, and celebrities obviously showed their affections to Vuitton's line. Here we were enjoying more handcrafted items for the super stars, including Lauren Bacall, Katherine Hepburn, Greta Garbo, and Elizabeth Taylor, to name a few. I know they may belong to a generation before us now but they sure were the divas at their time. 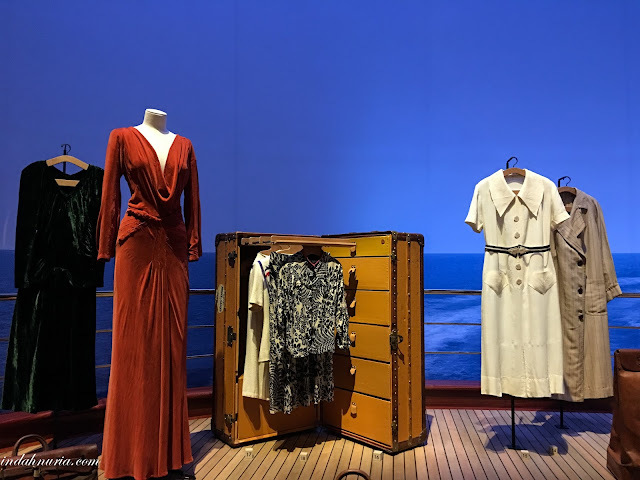 We saw bags, luggages, jewelry boxes and sequined evening gowns and dresses belonged to those stars from many walks of life. Here was where we read the history of the first parfumerie launched by Gaston-Louis back in 1927, fast forward to 2016 when the House of Louis Vuitton relaunched the fragrance line, including Apogée, my favorite! Too bad I kinda miss taking pictures in this section, but I did remember seeing more trunks and specialized bags for musicians and music lovers. 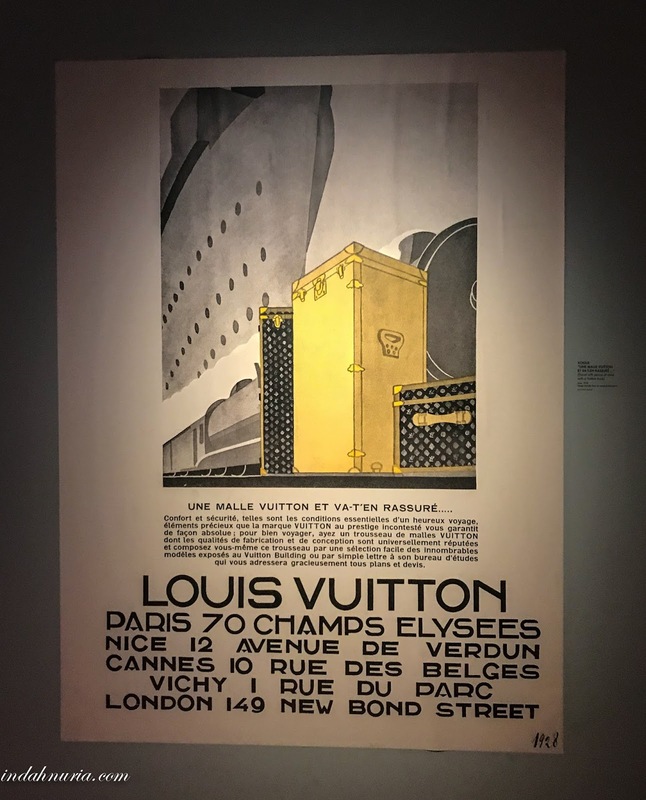 This is probably the most hip and colorful sections, showing another incredible journey as Louis Vuitton was introduced to to the US public in 1893 during the Chicago World Fair up until now. 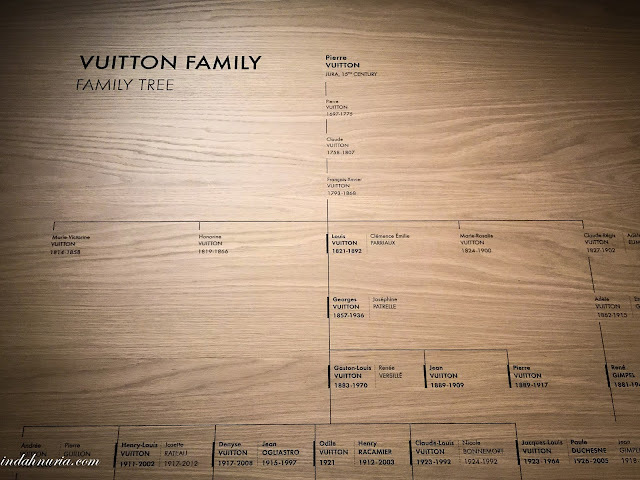 Expanding to America, since the beginning, Louis Vuitton has won the heart and attention from many prominent Americans, including J.P. Morgan family. 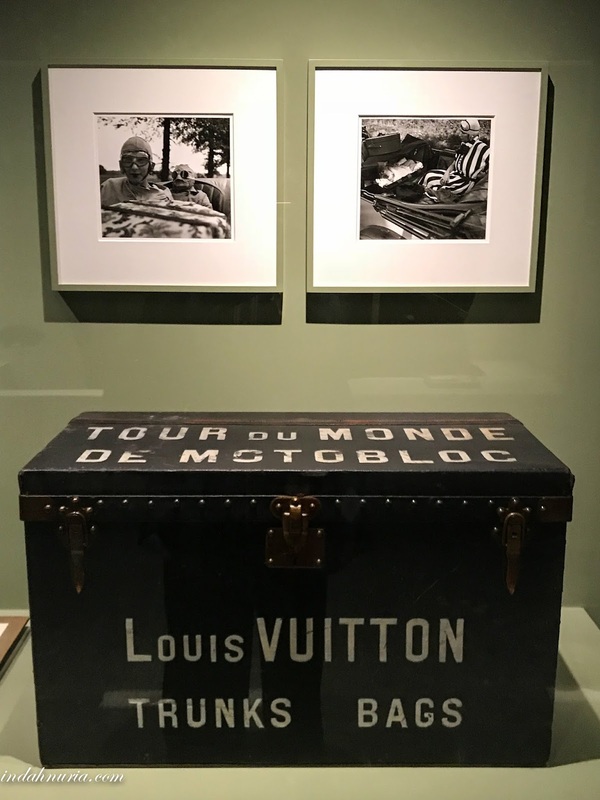 Louis Vuitton has been collaborating with so many famous and exceptional individuals along the way. 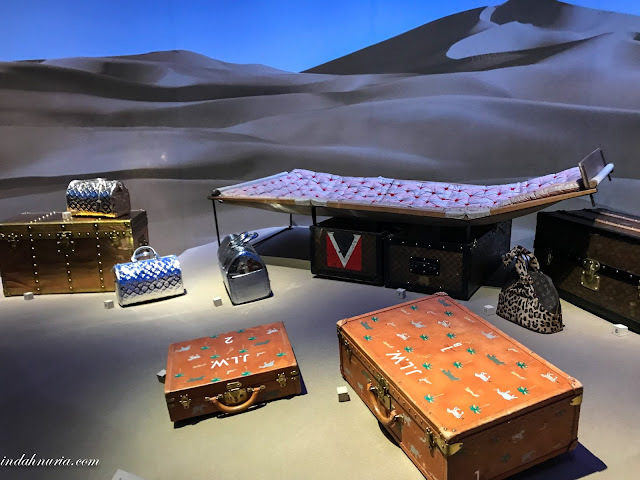 While Marc Jacobs was the Artistic Director, he indeed came up with interesting collaborations and guest artists to design the limited edition for the House. What I really like are the ones from Stephen Sprouse and Yayoi Kusama, as you have seen on the picture above. And then, more fashion items are designed, including those fabulous dresses, worn by the red-carpeter, if I may say :). I have nothing else to add at this point and let's see them in pictures, shall we? So ..that's pretty much it. I didn't realize it has been a long post indeed. But again as I said in the beginning, this is more than just a showcase of high-end products chosen and loved by many, but labors of love, passion and historic endeavors involving hard work, endless creativity, and exquisite taste. Now I feel like traveling in style with my favorite luggages :). Seriously, that is a dream exhibit for me. 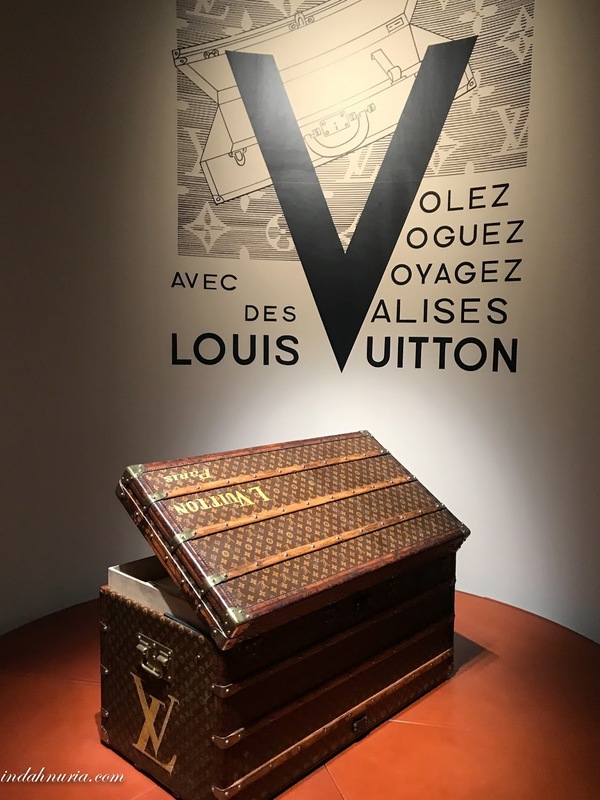 Who doesn't love to get sucked into the world of Louis Vuitton? Indeed Theresa..It feels like I don't want to leave LOL..but the exhibition is carefully crafted. It's amazing..
What an exhibition! The details and the collections are amazing. No wonder many people wanted to see it. It's like a museum of its own. 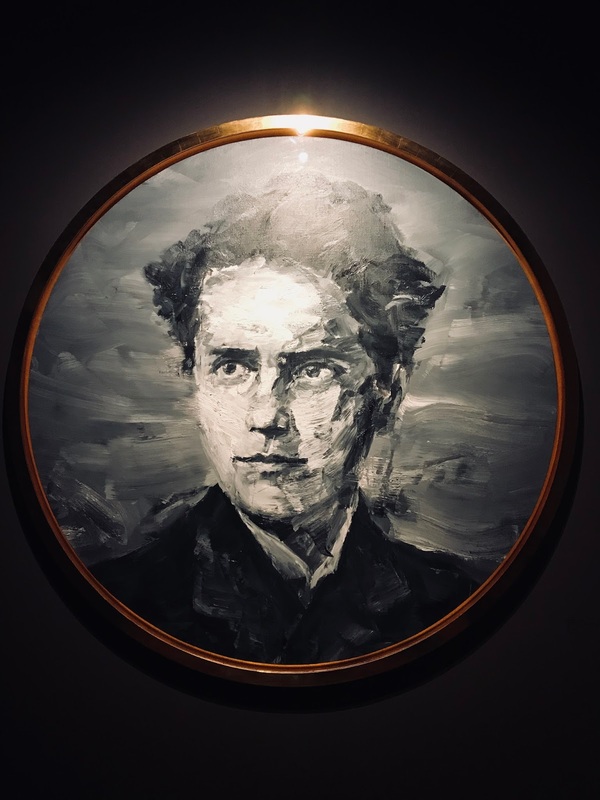 I like that painting of him! What a fun image of you against that red writing. 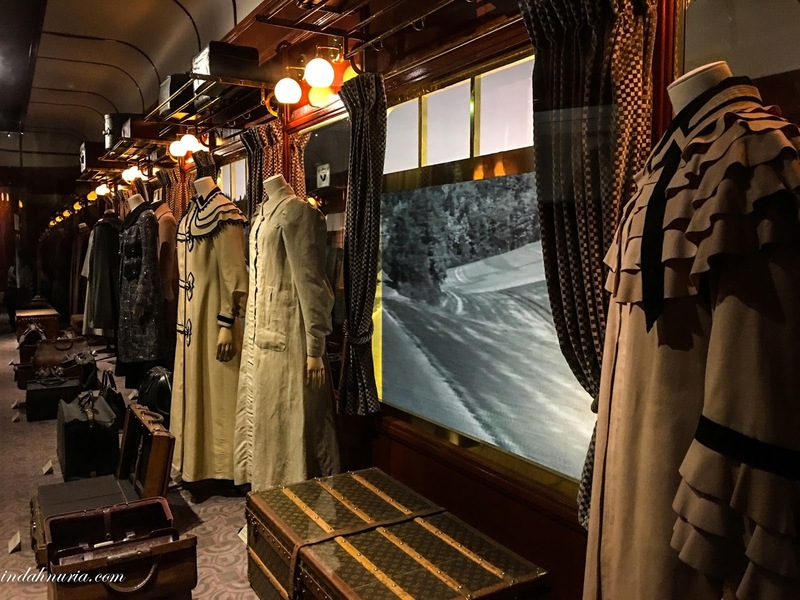 Pamerannya meMukau banget apalagi uniknya "The replica of the Orient Express"
What an exhibition with all those historical items. Great one! Wow! Those details and artworks are amazing. Not just a bag :). Incredibile works! Walking from Jura to Paris? Wow! Cm bisa mengagumi, blm sanggub beli tas2 nya LV wkwkwkwk :p. Kalopun aku nabung, kok ya sayang dibeli tas. 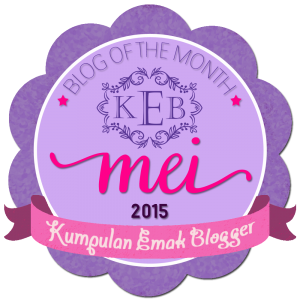 Mending traveling :D. Tp aku jd inget mba, bbrp thn lalu, kantorku ngadain trip ke eropa, dan ada 2 temenku yg bersaing dari dulu. Termasuk soal kaya2an.. Jd pas temen yg 1 beli LV, yg satunya ga mau kalah, lgs beli 2. Trs temen ku satunya beli 1 lg yg hrgnya lbh mahal hahahahaha.. Bingung aku, sampe segitu cinta dan ga mau kalah nya :D. Udh berasa kayak gorengan buat mereka berdua harganya..
Barang-barang yang dipamerkan bagus-bagus ya. 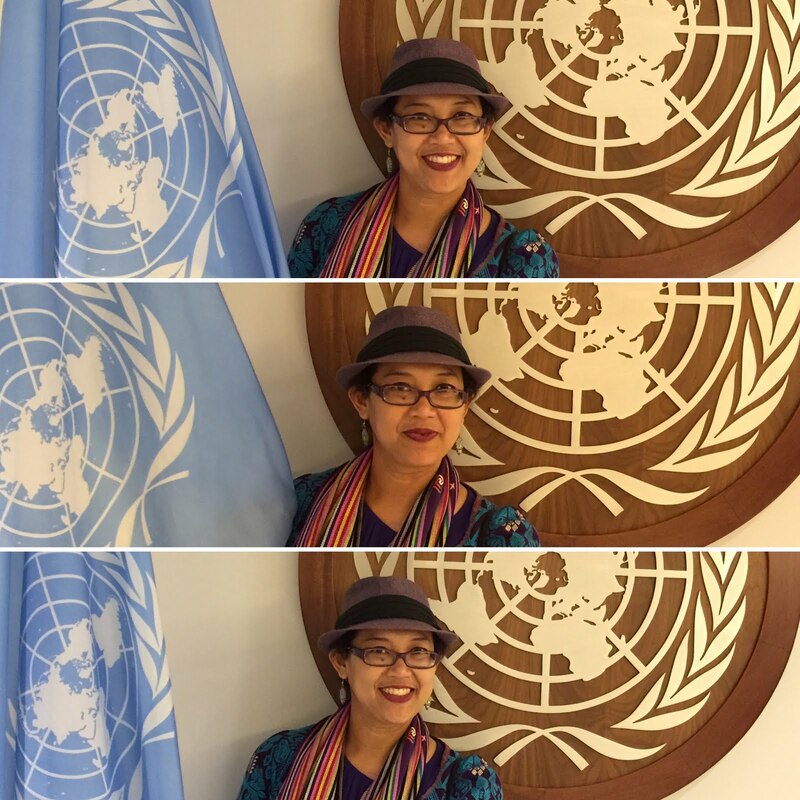 Dekorasi ruangannya juga bagus. Aaaaa luiz viton. 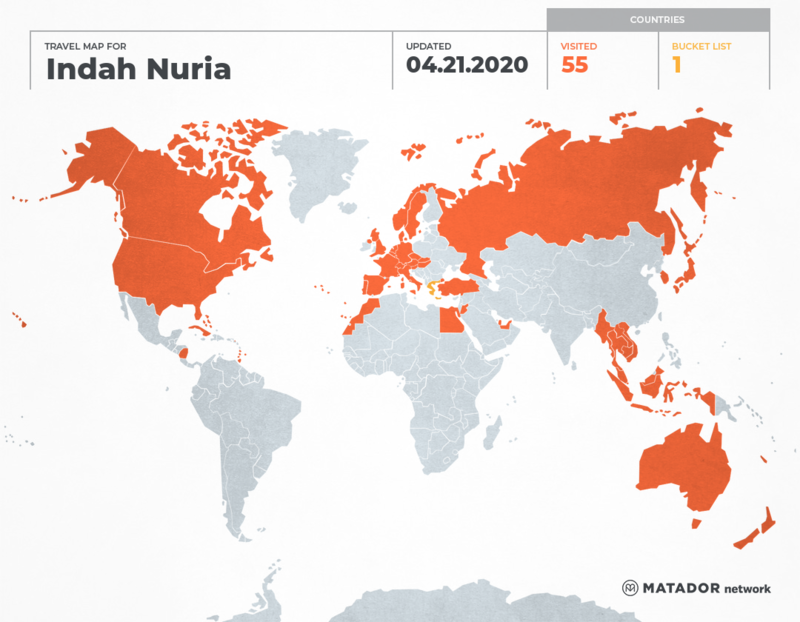 Btw gimana cara bacanya mbak? Vitong gitu ya?